TMR has tasked me, Skylar, with putting together a blog entry. During this summer, we sodalitiers have continued to socialize frequently, though the blog is less active than during the school year. This summer we said goodbye to our chaplain, Father Andrew Garcia S.J. We will continue to have Sodality Masses with other priests who kindly support us. 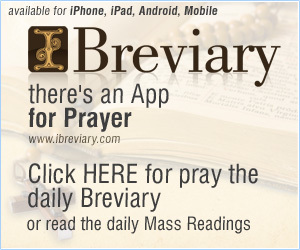 We now have many planned activities for the rest of the Ordinary Time and beyond. We would like to welcome another companion to our sodality leadership. Liz was a part of previous Catholic groups which Matt and I had belonged to before she and many of our other close friends moved away. She even knew our intrepid editor, TMR, before most of us did. She has now returned to Santa Barbara, and we are delighted to include her in the governance of the Sodality: we are now the G6 instead of the G5. We commence a planned series of posts about local history and mission art. Michael Aberle has contributed to the solidarity of our group in many ways, particularly through his artistic talents. In an exclusive interview for this blog, he imparted some of his vast knowledge of local history and spoke of his own artistic process. Michael is passionate about mission art and has produced paintings himself in that tradition. Some of this art is in the broader tradition of the santeros; artists throughout the southwestern United States during the (late) Spanish colonial period. Michael points out that this Spanish and Mexican colonial style of art is marked by simplicity and sincerity, which he finds very meaningful spiritually. He contrasts this style with the richness of Baroque art. Some of this mission art was painted on tin. Sacred art for the Catholics living in such contexts was particularly important for private devotion because access to the Mass and sacraments was sometimes quite limited. Some of the faithful lived at a distance from any of the missions; furthermore, in the 1830s most of the missions reverted to secular control (with the important exception of Santa Barbara). The first of Michael’s two paintings for the Sodality depicts Our Lady, Refuge of Sinners (Refugio de los pecadores), the patroness of our group. Michael discusses the importance of this title of Our Lady for the early inhabitants of Santa Barbara: Bishop Garcia Diego not only named her the patroness of California, he reinforced that title locally. The first educational institution of Santa Barbara, founded by Garcia Diego in the early 1840s, was the Refuge of Sinners School, which lasted until 1881. There are many paintings of Our Lady Refuge of Sinners dating from the 1800s, indicating that she was a popular subject of painting. In Michael’s rendering, consistent with these earlier versions, Mary is holding the child Jesus and looking off into the distance. Mary’s act of mothering helps us see how she is a refuge for all of us, who need her intercession and guidance. The baby Jesus appears to be standing on a cloud. They both wear crowns; Mary wears pearl necklaces and earrings. 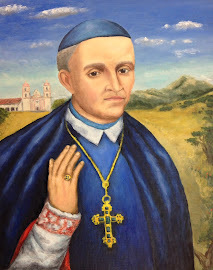 In an upcoming post, we will discuss Michael’s newly completed painting of Bishop Garcia Diego. Finally, note that tomorrow is the Feast of the Exaltation of the Holy Cross. Three of the G6 are planning to go together to Latin Mass in Camarillo. Next week, Wednesday, Friday, and Saturday are traditionally noted as Ember Days, days of penance occurring four times a year.